What is Jewish cooking in France? That is the question that has haunted Joan Nathan over the years and driven her to unearth the secrets of this hidden cuisine. Now she gives us the fruits of her quest in this extraordinary book, a treasure trove of delectable kosher recipes and the often moving stories behind them, interlaced with the tumultuous two-thousand-year history of the Jewish presence in France. In her search, Nathan takes us into kitchens in Paris, Alsace, and the Loire Valley; she visits the bustling Belleville market in Little Tunis in Paris; she breaks bread around the observation of the Sabbath and the celebration of special holidays. All across France she finds that Jewish cooking is more alive than ever. Traditional dishes are honored, yet many have acquired a French finesse and reflect regional differences. The influx of Jewish immigrants from North Africa following Algerian independence has brought exciting new flavors and techniques that have infiltrated contemporary French cooking, and the Sephardic influence is more pronounced throughout France today. • for a grand finale, there are Parisian flans and tarts, a Frozen Soufflé Rothschild, and a Hanukkah Apple Cake, as well as many other irresistible pastries and cookies. 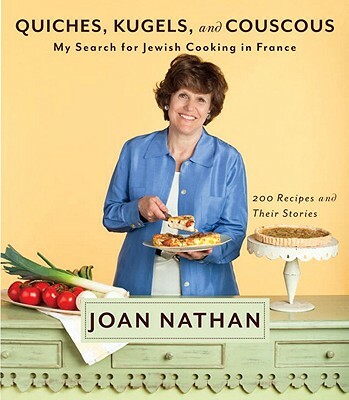 These are but some of the treasures that Joan Nathan gives us in this unique collection of recipes and their stories. In weaving them together, she has created a book that is a testament to the Jewish people, who, despite waves of persecution, are an integral part of France today, contributing to the glory of its cuisine. Joan Nathan was born in Providence, Rhode Island. She graduated from the University of Michigan with a master’s degree in French literature and earned a master’s in public administration from Harvard University. For three years she lived in Israel, where she worked for Mayor Teddy Kollek of Jerusalem. In 1974, working for Mayor Abraham Beame in New York, she cofounded the Ninth Avenue Food Festival. Ms. Nathan is a frequent contributor to The New York Times and other publications. She is the author of numerous books including Jewish Cooking in America and The New American Cooking, both of which won the James Beard Award and the IACP Award. She was the host of the nationally syndicated PBS television series Jewish Cooking in America with Joan Nathan, based on the book. The mother of three grown children, Ms. Nathan lives in Washington, D.C., and on Martha’s Vineyard with her husband, Allan Gerson. "An absorbing exploration of French Jewish food by one of America's foremost culinary historian-journalists, Quiches, Kugels, and Couscous presents a rich array of dishes, each of them supported by material which explains their place in local culture and the ways they have been influenced by French cuisine (and sometimes vice versa). From Parisian gefilte fish and Rosh Hashanah chicken with cinnamon and apples from Metz, to Alsatian pot-au-feu and Italian- and Tunisian-derived spaghetti with bottarga, preserved lemon, and harissa, this is French food and Jewish food from a wonderful perspective."